WPTools has the ability to repeat certain rows of a table at the start and the end of a page. These rows can be used to display sub totals if you use the calculation feature included in the WPReporter addon.The displayed numbers are usually updated at paint time, this means changes in the document (for example the change of the page break) causes also the sub totals to be changed to the correct values. The header and footer rows are repeated at page breaks. Optionally with WPReporter: Special fields can display updated information, for example the sum of all elements with a give name on the currtent page. Note: This feature is unique to WPTools. 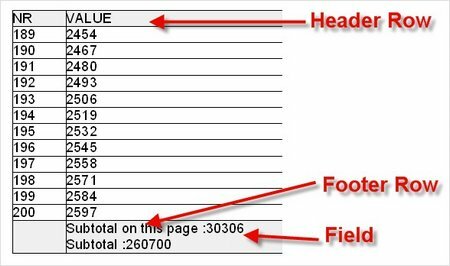 The RTF specification only defines the tag \trhdr to set a header row but there is no support for footer rows so we have to use a propritary tag. WPReporter makes use of this feature. A certain property can be used to avoid that RTF files are created which are too complicated for other word processing applications.